Hello friends and welcome to YNSC57 . 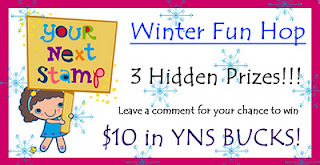 The challenge this week is to create a winter/holiday card using YNS. This is my first challenge as a Guest Designer and I am so darn excited to be here! Today YNS is sponsoring a blog hop filled with great prizes, 3 $10 gift certificates to the YNS store. Sweet! You should have arrived to my blog from Kerri's blog. Today I am posting a card I created with the adorable "Ellie Loves to Knit" stamp. I colored her with copics and promarkers. The patterned paper I used is from My Minds Eye. I added a fun foam glitter snowflake and a pretty blue rhinestone. Both the polka dot ribbon and white ruffled ribbon are from Hobby Lobby. I hope you like my card! I hope that you play along with our challenge and be sure to hop along and visit all of the DT blogs so that you'll have a chance to win 1 of 3 $10 gift certificates! Your next stop on the hop is the super talented Jen R.
Great card-wonderful colour choices. congrat on being a guest designer, well deserved. Great blog. This is so sweet! I love the dp you used and your fab ribbon treatment! So cute! I love that stamp and the layered ribbons! Congrats on being the Guest Designer for YNS! YOur card is so adorable, thanks for sharing. Super sweet card! I love the colors and the fact she is knitting! Veronica this is such an adorable card. So glad you are with us this month at YNS. Oh Ronnie, she is so very sweet! Love how you did the ribbon! This project gives me warm fuzzies! Reminds me of my Mom who used to do a fair amount of knitting. Jen, What a sweet card, I love the colors and YOUR coloring. Super sweet! Thank you so much for joining in all our fun this month!!! What a warm, cozy card you've created with this beautiful image! Congrats on being a guest designer! Cute card with the stitching and what a great LO too!